Wood River High School football fans got their money’s worth Friday at Hailey’s Phil Homer Field. They saw three games for the price of one. The first “game” lasted for the first three periods and was a laugher, the Wolverines building a 37-7 cushion with a dominant running attack. Over 48 minutes Wood River (19 rushing first downs) out-rushed Burley 374-89 with a 34-14 bulge in possession minutes. Friday’s second “game” was nerve-wracking for home fans. As quick as you can say, “What has come over the Charlestown Chiefs?”, the scrappy Bobcats turned a laugher into a scratch-and-claw nailbiter. Burley stormed back from a 30-point deficit and tied it 37-37. Burley’s sophomore quarterback Zander Cook (15-for-22, 179 yards) finished with three touchdown passes. The Bobcats scored on an 85-yard punt return and after a Hailey fumble. Yet the third “game” was the decisive one. Wood River’s offense showed a tremendous amount of poise in the final two-and-a-half minutes to shrug off Burley’s fired-up momentum and quickly drive for the winning points. Senior Trevor Brand kicked the game-winning field goal from 31 yards out with 25 seconds left in the fourth quarter for the 40-37 final, as senior Tommy Bailey held it and sophomore center Jackson Toothman made a strong snap. It turned out to be a record-setting Wood River football victory—the biggest point total (77 points) in which the Wolverines pulled off a home win. You might even say there were four “games” Friday night, since Brand coached the Powderpuff seniors at halftime to a last-minute win on a spectacular run by Hannah Belloli for the game’s only touchdown. Wood River (2-4, 1-2 league), with five TDs by four different players, captured its first home win and first league victory of the season and snapped a four-game losing streak. Burley (3-4, 0-3) dropped its fourth game, all very close in the final outcomes—by 6, 1, 7 and 3 points. Joking in the aftermath, Stilling said, “We saw some people leaving early so we thought we’d make it close. “Seriously, I told the kids afterward I was mad and proud at the same time. I didn’t know they had it in them. We had floundered to score points for four straight weeks. To get into field goal range as quickly as we did without throwing the ball, to have Gus (Conrad) make a huge kickoff return, and to have Trevor come through in the clutch, well….. Boosted by the return of senior center Buck Horn, out four games with a concussion, the offensive line fired off its marks and opened holes up the middle and around end from the get-go. Helped by Adrian Medina’s onside kick recovery, the Wolverines owned the ball for the first 10 minutes. They out-rushed Burley 113-1 in the first quarter. In the first 18 minutes, they ran 38 plays to Burley’s four. They drove 65, 67 and 61 yards for touchdowns. They went 5-for-7 in third-down situations in that span, 9-for-14 for the game and 3-for-3 on fourth downs, and built a 20-0 halftime lead. Joining Horn on the line were sophomore guard Jackson Toothman and junior guard Jon Reigle along with senior tackles Chris Carnes and Wyatt Griffith. Senior Joe McGonigal played one of the ends. But injuries continued to limit Wood River’s options—Drew Barsch, Champe Kotara, Quinn Guthrie, Ian Keys and Karel Kaiser sidelined. “I think we had 10 or 11 new starters compared to our first game against Buhl,” Stilling said. Senior running back KJ Savaria (26 carries, a team-high 134 yards) continued to be a pillar of strength. Junior Gus Conrad (13 carries for 127 yards) and senior quarterback Tommy Bailey (16 carries, 66 yards) stepped up in the ground game. Conrad returned a kickoff 96 yards for a 27-7 Wood River lead, right after Burley tallied its first TD on the first of three TDs by Carson Hawker. In all, there were 10 touchdowns scored in the long two-hour and 55-minute struggle. None was more fun than sophomore Parker Bingham’s stunning 34-yard dash to paydirt with a recovered fumble midway through the third quarter. Wyatt Griffith and Jackson Toothman applied a strong pass rush on Cook. The quarterback sack by Griffith popped the ball loose. Bingham knew what to do with it. Go! “It was an exciting moment. The kids were kidding me about how high I jumped when I saw him running,” said Stilling about the touchdown that gave Wood River a 34-7 lead. Earlier in the game, it was all business for a Wood River team that hadn’t scored a point in the first half for four games. Mixing pitches around the end with dives up the middle, Wood River on its first drive moved 65 yards in 12 plays after a 34-yard Cooper Bailey kickoff return. Bailey scored his first touchdown of the season and second of his career around the left end for a 6-0 lead. Stilling said kickoff specialist Brand has been talking to the special team all season about slowing down on onside kickoff attempts to make the play more effective. But Brand was four yards ahead of everyone on the subsequent onsides kick. Brand dislodged the ball from a Burley player and Adrian Medina pounced on it. Wood River marched to the Burley 20-yard-line, but Brand’s 38-yard field goal attempt was short on 4th-and-8. It made Brand 0-for-2 on field goals for the season. Last year Brand kicked 19 extra points, but had no field goals. After the Wolverine defense held Burley to four-and-out, the home team moved 67 yards in 13 plays covering six-and-a-half minutes with Conrad scoring his first TD of the season and second of his career from three yards out. Brand (8 extra points this season) was 4-for-4 on the night and succeeded on his first extra point for a 13-0 lead. One more defensive stand led to Wood River’s third TD. “We had some many different kids in different spots on defense. I really thought our defense played hard and well,” said Stilling. Big plays in the 10-play, 61-yard scoring drive for a 20-0 halftime lead were a 10-yard Tommy Bailey keeper on 3rd-and-long, a 17-yard Conrad dash through a big hole up the middle and a Tommy Bailey 15-yard end run after a terrific ball fake to Savaria. With 23 seconds left in the half, senior Carson Hawker of Burley returned the kickoff 76 yards to the Wolverine 20-yard-line, then Cook connected with Hawker for a 12-yard first down. Wood River’s defensive line put a big rush on Hawker on the final play. His throw into the end zone was high. Burley came out of the locker room determined to establish its running game with junior Travis Osterhout (12 carries, 53 yards) and loosen up the Wolverine defense so mobile quarterback Cook could pick apart the secondary. Cook’s nine-yard TD pass to Hawker cut the Burley deficit to 20-7, but Conrad came right back with his 96-yard kickoff return for a touchdown. After that, Bingham made his startling fumble return. It was 34-7. On the second play of the fourth quarter, Brand capped a 12-play, 66-yard Wood River drive with the first field goal of his career, a clean shot from 23 yards out. It made the score 37-7 with 11 minutes left—a seemingly insurmountable lead. Burley’s Cook hit Hawker for a 60-yard scoring strike. Burley’s Allan Jeppsen recovered the onsides kick and Cook threw to Brandon Hosteen for a 24-yard score and a 37-21 margin. That’s when Burley coach Jed Thomas did the arithmetic and determined that two-point conversions were the only answer to earn a tie. Cook tossed the first of his three two-point passes to Tanner Sprenger. The Bobcat defense held, and Hawker returned a punt 85 yards making the score 37-29. “I’m sure it will sound like we’re making excuses, but we just haven’t had enough players to fully practice with our special teams. Our kickoff team and punt team had a hard second half,” said Stilling. By this time, Burley was in full attack mode. When Savaria coughed up the ball and Brayden McCracken recovered it at the Wolverine 47 with 4:10 left, the inevitable happened—Burley rolled down the field in five plays for the touchdown making it 37-35, and Cook passed again to Hosteen for the tie. Coaches and players were shell-shocked along the sideline, but the Wolverine offense took matters into its own hands. Conrad returned the kickoff 42 yards to the Wolverine 47, and Savaria bounced outside for six more. Conrad added six for a first down. A pass interference whistle on Conrad’s option pass to senior Jared Anderson advanced the ball to the Burley 29, and Cooper Bailey carried a pitch for 10 yards to the 19. Savaria rammed straight ahead for seven more yards and then earned a first down with second effort to the Burley 7.
Cooper Bailey struggled on an end run and nearly made the end zone, but a holding call set the Wolverines back to the 15-yard-line. With 31 seconds and no time outs left, Stilling told Tommy Bailey to spike it setting up a 3rd-and-goal. And so did Brand, who had been running up and down the sideline and stretching and getting his mind on the task. He drilled it from 31 yards, then Jared Anderson’s clutch interception stopped the last gasp of Cook and Burley. Check game statistics from Friday’s exciting game on today’s Express Web site. Wood River visits the Jerome Tigers Friday, Oct. 19 at 7 p.m. for a pivotal Great Basin Conference game against a Tiger squad still in the mix for a State 4A playoff berth. Jerome (3-4, 2-1) came up a short in Rupert last Friday, falling 32-26 to league-leading and two-time defending GBC champ Minico (5-2, 3-0). The Tigers haven’t won a league title in nine seasons since 2004, placing second four times. They’ve already beaten Twin Falls (3-4, 2-1) by a 39-36 score Sept. 28, so the Tigers (27.7 ppg offense, 30.0 ppg defense) need to beat Wood River (15.3 offense, 27.7 defense) and win at Burley in the Oct. 26 finale to nail down of the second GBC berth to state. Last year at Homecoming, Wood River out-rushed Jerome 382-115 and piled up the most points ever in a Wolverine football win over Jerome. The final score was 35-22 on the Hailey field, Greg Lindbloom rushing for 212 yards and scoring three times. Although Jerome was very effective on third and fourth down, the Tigers turned the ball over three times. That victory cut Jerome’s lopsided advantage in the 39-year rivalry to 34-5. Wood River teams have never won at Jerome, coming the closest in an 18-17 loss back in 2006 for then-coach Mike Glenn. 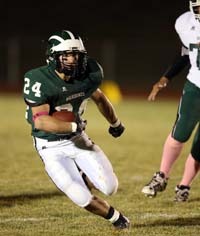 Wood River’s last visit to Jerome in 2010 ended in a 35-13 setback. WOLVERINE NOTES—Friday’s other league games are Twin Falls at Burley, and Minico hosting Canyon Ridge (2-5, 1-2). The Canyon Ridge Riverhawks are averaging just one touchdown a game. They lost at home to Twin Falls 27-0 last Friday. Wood River had come out on top of high scoring home games in recent years, but nothing matched the 77-point combined total that Hailey and Burley put on the board Friday night. The Wolverines won at home 40-32 over Preston in 2006, 62-8 over Gooding in 2002 and 42-34 over Glenns Ferry back on Sept. 14, 2001. Sophomore Zac Swanson was one of several sophomores who stepped in and did a good job in the second half for Wood River. Swanson carried the ball six times for 27 yards in the second half…..Conrad ended the night with 269 yards in all-purpose yardage including 142 yards in returns….Hawker (246 yards in returns) led Burley with 334 all-purpose yards. The final Wood River’s junior varsity home game is Thursday, Oct. 18 at 6:30 p.m. against Jerome at Phil Homer Field. The final JV game of the season is Thursday, Oct. 25 against Canyon Ridge in Twin Falls. Freshman player Illiah Pfau made a pre-game visit with his father Michael along the sideline Friday and received a warm round of applause. Pfau suffered a neck injury during the Sept. 26 home junior varsity game against Minico and was life-flighted to Boise, where he has been rehabilitating since. Burley—Carson Hawker, 9-yard pass from Zander Cook (Jorge Cardenas kick); 7:45 3rd (20-7 WR). Rushing—KJ Savaria 26-134, 7 1sts; Gus Conrad 13-127, 7 1sts, 1 TD; Tommy Bailey 16-66, 3 1sts, 1 TD; Zac Swanson 6-27, 1 1st ; Cooper Bailey 5-16, 1 1st, 1 TD; Hayden Thayer 1-4. Kickoff returns—Gus Conrad 2-138 with a 96-yard TD return; Cooper Bailey 2-42. Fumble recoveries (2)—Adrian Medina 1; Parker Bingham 1 with a 34-yard TD return. Tackles (36)—Gus Conrad 5, Zac Swanson 4, Joe McGonigal 4, Hayden Thayer 4, Cody Richmond 3, Tommy Bailey 3, Cooper Bailey 2, Wyatt Griffith 2, KJ Savaria 2, Kole Mauldin 2, Jackson Toothman 1, Parker Bingham 1, Jon Reigle 1, David Soares 1, Jared Anderson 1. Rushing leaders—Travis Osterhout 12-53, 2 1sts, 1 TD; Zander Cook 2-29, 1 1st; Brayden McCracken 1-6; Allan Jeppsen 1-1. Passing—Zander Cook 15-22, 179 yards, 6 1sts, 3 TD, 3 conv., 1 interception. Receiving—Carson Hawker 5-88, 1 1st, 2 TD, 1 conv. ; Brandon Hosteen 5-51, 3 1sts, 1 TD, 1 conv. ; Tanner Sprenger 4-37, 2 1sts, 1 conv. ; Travis Osterhout 1-3, 1 conv. Kickoff returns—Carson Hawker 5-161; Travis Osterhout 1-5. Punt returns—Carson Hawker 1 with an 85-yard TD. All-purpose yardage—Carson Hawker 334, Zander Cook 208. Fumble recoveries (2)—Allan Jeppsen 1, Brayden McCracken 1. Sacks (1)—Thomas Rasmussen, Bernardo Solis and Juan Labra 1-11. Tackles (95)—Juan Labra 14, Jason Rebollozo 12, Tyson Greener 8, Travis Osterhout 8, Brandon Hosteen 7, Tanner Sprenger 7, Brayden McCracken 6, Chris Dayley 6, Thomas Rasmussen 5, Spencer Anderson 4, Carson Hawker 4, Anson Call 2, Tanner Wright 2, Bernardo Solis 2, Adam Hepworth 2, Wyatt Wodskow 2, Zander Cook 2, Allan Jeppsen 1, Damien Hernandez 1.